Rosemary Sea Salt Chicken is so simple and easy to make that you’ll want to make it all the time. It’s simple ingredients, healthy, and made in a cast iron skillet. I love the benefits of using a cast iron skillet to cook in. A cast iron skillet is easy to clean, you get the benefits of the iron, and there’s just something old-fashioned and good about cooking in an iron skillet. Place your chicken on a plate and salt and pepper the chicken thighs, both sides. In cast iron skillet, heat 1/2 of the olive oil over medium/high heat. Add the rosemary into the skillet. Add chicken thighs and cook for about 5-7 minutes flipping over, cooking on the other side for another 5-7 minutes. 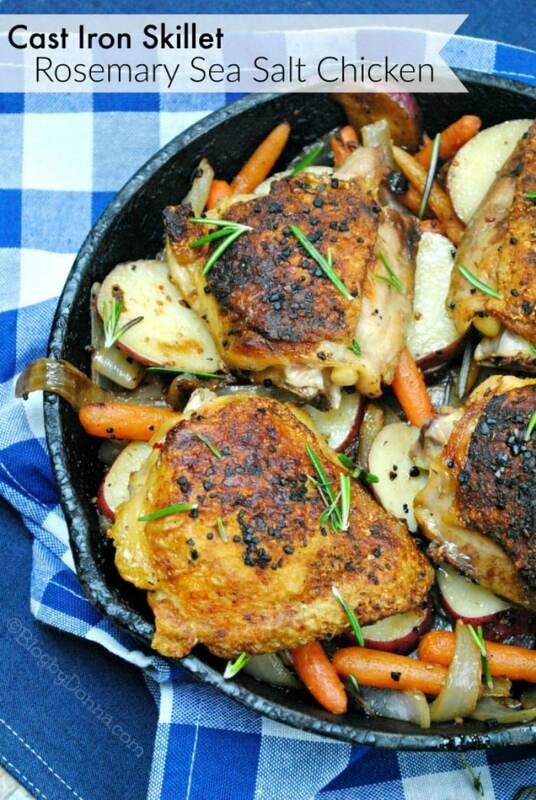 Remove the chicken thighs from the skillet. Set aside. 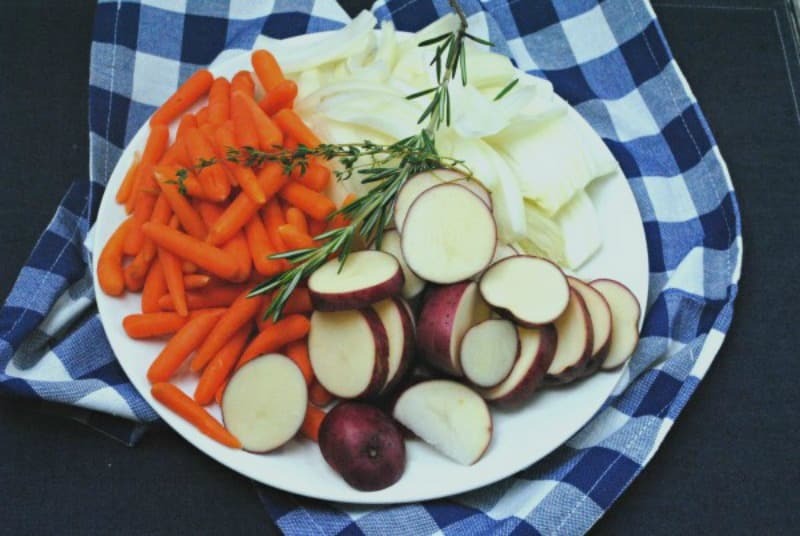 Turn down heat to medium and add the sliced red potatoes, onions, and carrots to the skillet. Drizzle olive oil over the veggies. Sprinkle with the sea salt. Add the thighs back on top of the veggies and cover. Cook for additional 20 minutes. Flip the thighs over half way through the cooking time. Remove the skillet from the heat to check the thighs. If done allow the chicken and veggies to rest for 3-5 minutes. If not return to the heat until the thighs are done. Flipping the chicken over half way through the time. 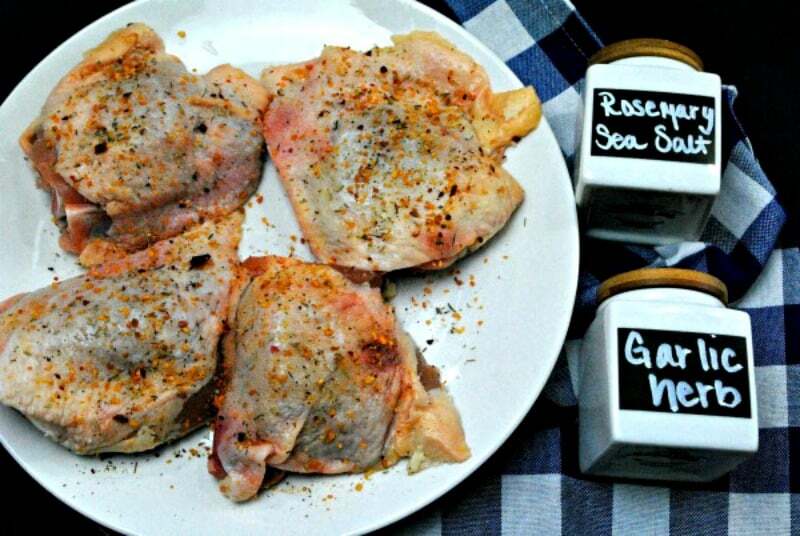 Looking for a delicious side dish to pair with the Rosemary Sea Salt Chicken? Try this Carrot Salad with Raisins and Pineapple. 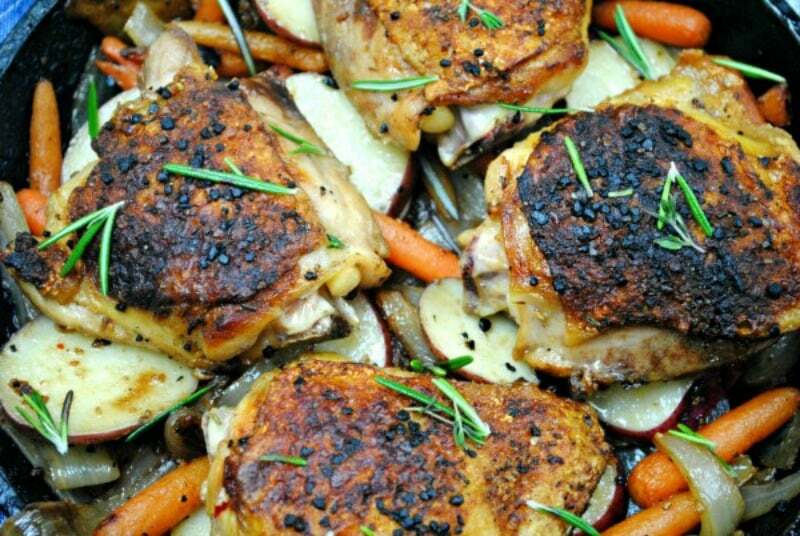 My family loves the wonderful flavors of the rosemary and sea salt in this Rosemary Sea Salt Chicken meal. It’s a one pan, easy, cheap, and delicious dinner any day of the week. 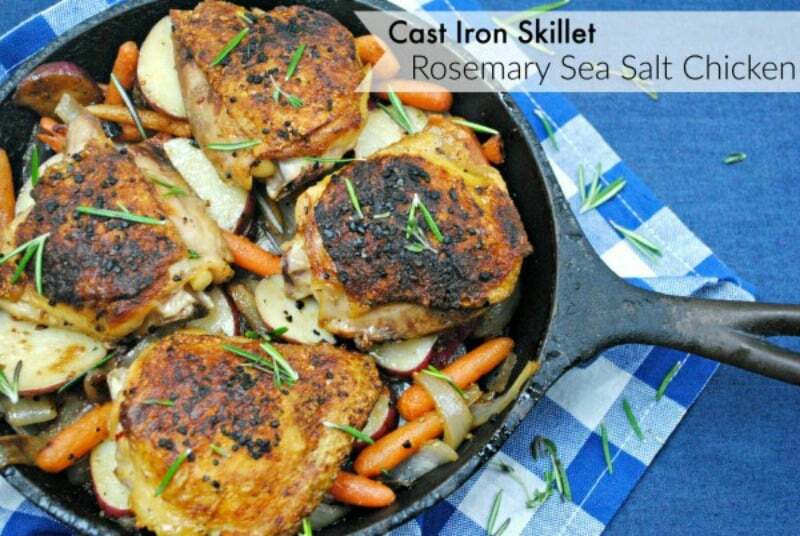 Last week I made a delicious cast iron skillet Honey Lime Chicken recipe. Remember, if you like this post, please take the time to follow all my projects and finds here on Pinterest. 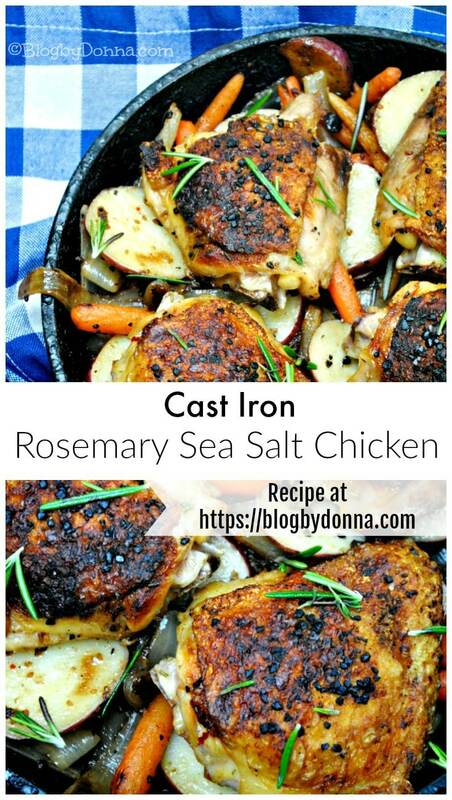 And pin this Rosemary Sea Salt Chicken recipe for later. I had to pin this to make later! Thank you for the recipe, yum! I have never used a cast iron skillet before. I believe I need one now. I like that it’s all in one pan. I like the idea of cooking everything in one skillet.And I have a cast iron skillet. Mmm!! this looks delish!! I LOVE that you left the skin on the chicken!! It gives it SUCH amazing flavor! This chicken looks delicious. Thanks for sharing the recipe!